The Prime Hospitality Group has purchased and is already working on a building on the corner of East 12th & Ave J in Brooklyn. The 2 story restaurant is being converted into 2 kosher restaurants, one dairy and one meat. DAIRY: The dairy restaurant will be a combined Pizza da Solo & Shake Factory. Shake Factory is a new addition to the Prime family of restaurants serving exotic fruit shakes and Pizza da Solo is possibly the best kosher pizza you will ever try, although it is pricey. 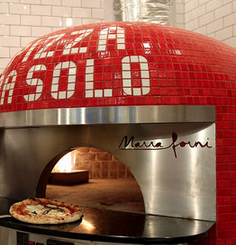 The first Pizza da Solo location is located in the SONY building in midtown Manhattan. MEAT: The meat restaurant will be a Prime Burger, the second installation of this restaurant. The first Prime Burger opened earlier this year on the Upper West Side. No word on opening date yet. Kashrut will likely be under the OU, as are their other restaurants. NOTE: A previous version of this post mentioned they’d be taking over the Kosher Delight building, they are not.